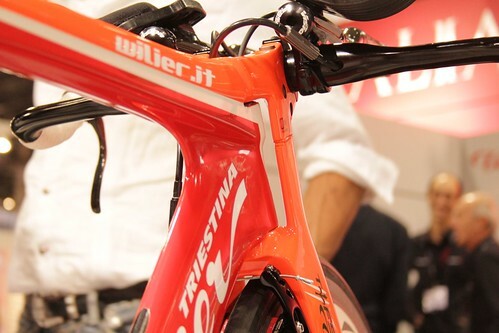 Getting back to aero frames that I saw at the trade shows last fall, Wilier Treisitina had a time trial bike that was a magnet for for both interest and skepticism. 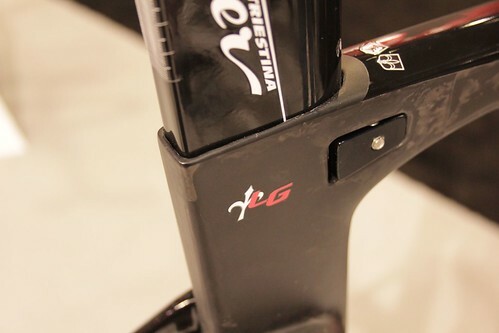 The Twin Foil’s frame clearly followed the Kamm foil approach to the UCI 3:1 aspect rule by having shapes that were basically deep foil sections with the tails cropped off. In that respect the Twin Foil shares similarities to any number of road and time trial bikes like the Trek Speed Concept and Felt Foil. 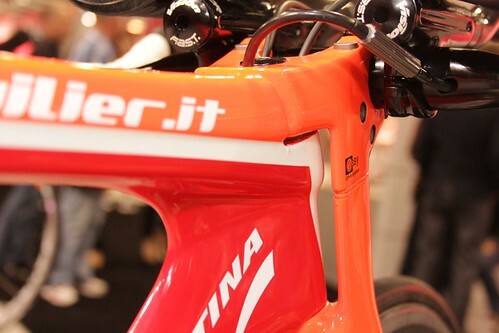 Make what really made the Wilier Treistina stand out was its fork that had 2 foil shapes running parallel up from the fork crown to an integrated stem that spanned the foils as well as the top of the steerer. A handful of people glommed onto the display bike, while another group stood back wondering what improvement the foils could make to the airflow that would justify the increase in frontal area. 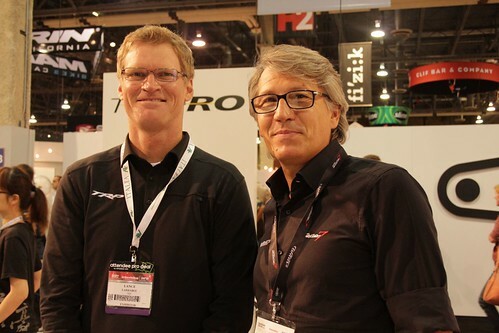 Close at hand was Wilier’s Claudio Salomoni (at right in photo with Lance Larrabee of TRP ), who has worked with both TRP and FSA to develop components for the Italian bike company. 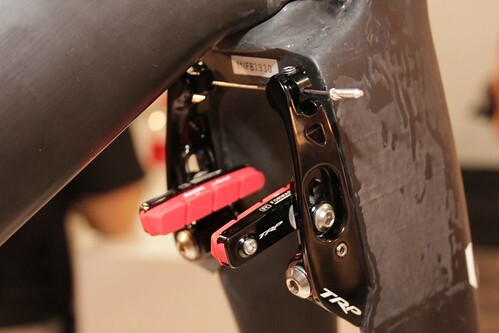 TRP contributed the integrated brakes to the Twin Foil bike. 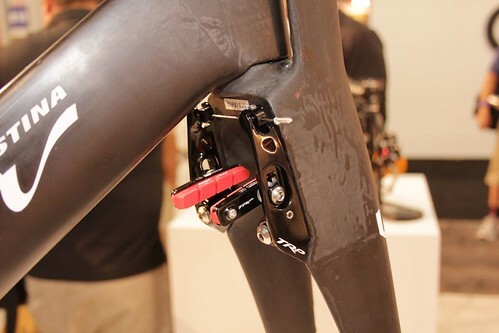 The brakes themselves are very short arm, liner pull cantilever brakes, and there bear a slight family resemblance to TRP’s well-received linear pull cyclocross brakes. 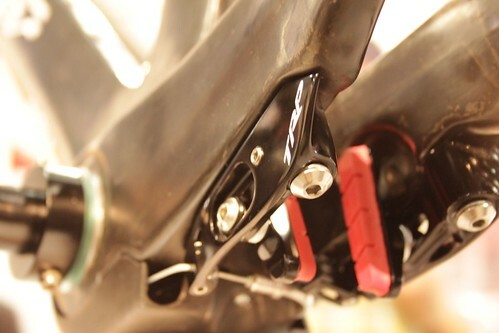 On the fork, the brake is mounted at the trailing edge of the fork blade and continues the blade’s contour aft. 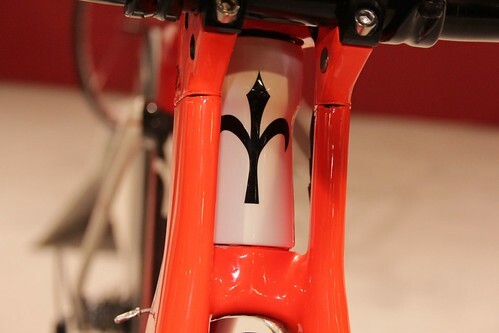 On the frame, the brake is hidden behind the bottom bracket and blended into the lower portion of the chainstay. 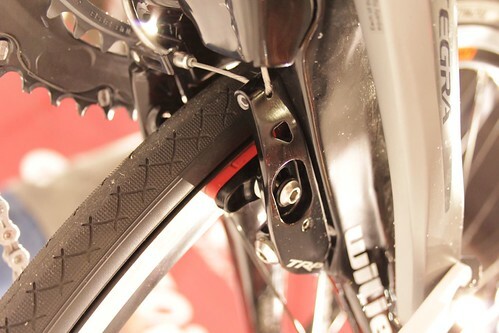 Brakes like these are also featured on several other manufacturer’s bikes as well. Salomoni was also a driving force behind the BB386EVO standard for cranksets. Workin with FSA, Wilier’s designer basically took the best part of BB86 and BB30, and came up with a crankset that would fit a maximum variety of frames. To explain, BB86 was one of the first new bottom bracket standards. 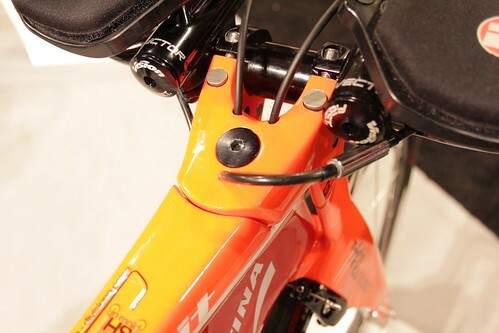 It uses 24mm ID bearings mounted into plastic cups and press fit into a non threaded frame. The outside faces of the bearings are 86mm apart, just as if the bearings were external bearing BB cups threaded into a traditional 68mm BSC shell. This allowed the frame to be made lighter with no need for threaded metal inserts, and a full 86mm of room for chain stays and down tube for a very stiff carbon frame. BB30 and later PressFit BB30 (sometimes PF30) use large 30mm ID bearings that alloy for very stiff alloy spindles that actually weight quite a bit less than 24mm steel spindles, but the BB30 shell prevents designers from making the frame wider than the 68mm of the shell. BB386EVO takes the 86mm wide frame dimension from BB86 and bores it up to fit the alloy spindle and big bearings from BB30; in fact, it uses actually PF30 BB cups. 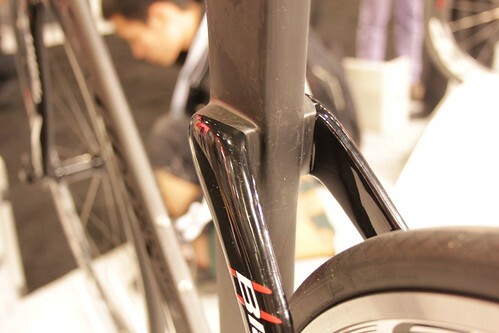 BB386EVO cranks have the same Q-factor as BB30 cranks, but the spindle is longer. Before you storm out of the room screaming in response to yet another BB standard, let me tell you that this particular combination of dimensions means that BB386EVO cranks can fit frames designed on the same standard as well as BB30, PF30, and even 68mm BSC (the last with threaded 30mm ID external bearing cup BB). And the BB386EVO frames can fit 24mm spindle cranks (Hollowtech II, GXP, FSA) as well as the BB386EVO cranks. Not quite a universal fit, but pretty good.